Judges honor achievements for the company’s new web services and new lead generation solution. We’re gratified to receive this recognition from respected industry peers and hope it will help spread the word of new capabilities we’ve introduced. 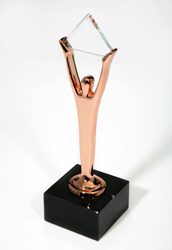 GetResponse captured Bronze Stevie® Awards in two categories in the 14th Annual International Business Awards: Best New Software Product or Service of the Year - Web Services Solution, and Best New Software Product or Service of the Year - Lead Generation Solution. Some of the world’s most accomplished Internet marketers present their core content using a series of webinars to generate interest in their products and services. Typically, the presentations build to a compelling call to action that drives prospects to a sales landing page. They promote the webinars using email marketing. To serve this market, GetResponse integrated three services — webinars, email marketing, and landing pages — creating expanded service packages with bracket pricing, each catering to the needs of different size organizations. All three brackets include email analytics to help marketers optimize their performance and a multi-user functionality for streamlining the marketing operation. Today’s email marketers require automated processes that make it easy for prospects to signal their interest. So every service package includes an array of sign-up forms, each preformatted to fulfill a specific business purpose. Form types include newsletter sign-up, ordering, download, course sign-up, feedback, event sign-up, seasonal, and blank forms to facilitate total customization. GetResponse serves more than 350,000 active users from 182 countries, delivering more than 1 billion permission-based emails per month, with an average deliverability rate greater than 99.5 percent. Clients include Marriott, Intercontinental, University of Arkansas, Carrefour, Men’s Health Magazine, AVON, and thousands of fast-growing businesses and professional firms. For more information, visit http://www.getresponse.com.